The other week a surprise came in the post from my friend Moa in Sweden. 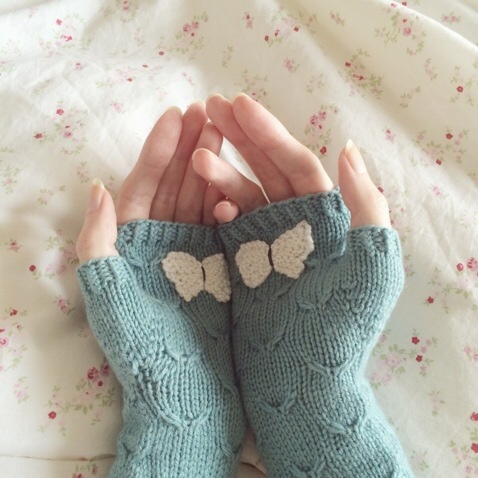 She had knitted these beautiful gloves for me, with butterflies upon them, aren't they gorgeous. The inside of the glove has a butterfly - to be as if you're holding it, which I think is so sweet. 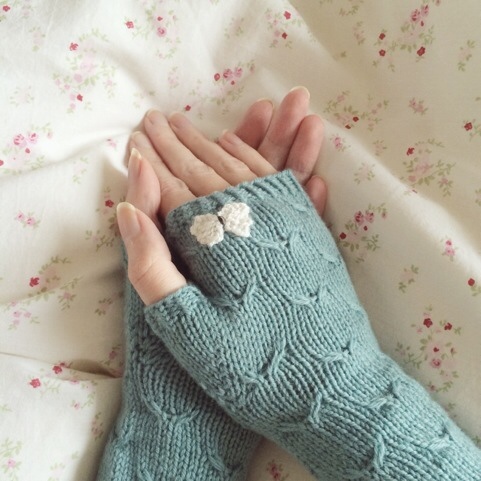 The knitting is so exquisite, and I love how they look on. Jen (mayfith) likes to make things from vintage ephemera, as do i. she sweetly asked to send me some of her crafts, and these little goodies arrived in the post for me. i will also share what i send jen in return when i have been able to put that together for her in a bit of time. 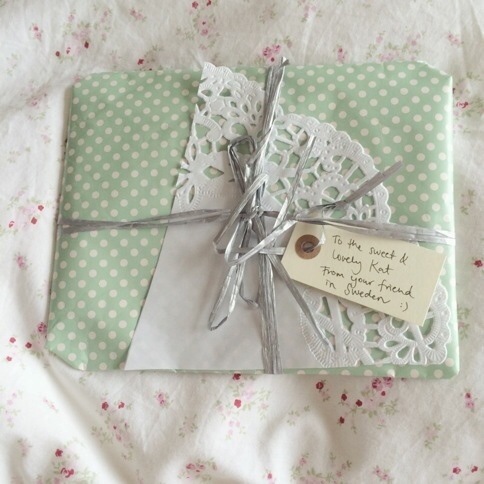 Post like this seems like a treat, and it is, but at the minute it's also a life line for me, I'm holding on to the love and care in each parcel or letter SO much, I can't tell you! Speaking as someone on the recieving end of such mail I can guarantee that it's a tonic they need, that its a blessing, and so much appreciated. This time though,i have been learning about unconditional love in the form of worthiness to recieve. As during some of the harder times I've been having the past 3 years, things have been very different, I haven't been in the role of supporter but if supported. I've been looking at why that is and learning from my reflections there. I just wanted to say that it's been strange and taken some getting used to, to be the receiver of much kindness. Especially whilst too unwell to make things and give things back in exchange - which I know isn't expected but is natural enough to want to do. I'm embracing the gifts, the mail and the loving care. And I'm also learning from its prescence in my life. I'm soaking up the strength from being cared about in this way. I'm also working through letting go old patterns of not having that same care towards myself. What I give to others I'm recognising I'm in need of myself. What I'm recieving from friends I'm recognising is a reflection of this new view of myself and new self love. I hope my reflections resonate with something in you also, I share them for that, but I also share them because I just had to write it down. Helen's shop shelves at Icklebabe are currently brimming with plates of equal charm, some say home sweet home, some say happy day and some have whimsical animals, with balloons and teacups, nestled amongst flowers. you'd love them too. I was browsing on etsy the other evening and discovered these new designs of masking tape. Definately some to add to the christmas shopping list, for me, for wrapping with or for pressies! I have lately been making these little fairy garlands for friends.This one was specially for the lovely Maddy in California. The fabric is a gauze and has a floaty feel to it. I like it's lightness and placing it with the lace trim gave it enough weight to drape but still catch the breeze. Which was important to me. I like the little squirrels and raspberries on the large flags, and the tiny flags are in a liberty fabric. I added charms to the end, and it can be tied with the Bakers twine, onto a mirror, moodboard, across a window, or between pictures upon a wall. I placed it inside this little box to post, adding a mother of pearl white bunny and stitched Mon Amie (my friend) ribbon to a scrap of vintage fabric. One of the things i like to do, is create pretty post to mail to friends. while still making gifts that are special. One of the best ways to do this i have found, is to purchase items in sets that can be split up. i thought i'd share what went into creating these postcard and pencil sets above. I then gathered the above supplies from my craft items, Orla Kiely wrapping paper on a roll is avaliable at John Lewis online, the other items are things i have had for quite some time, but similar can be found at online scrapbooking shops. From left to right : Prima paper flowers, Anna Griffin ribbons, Making memories brads, Pearl stickers, sellotape, Vintage mother of pearl buttons, ribbon with wording. I cut ribbon to hold a set of 7 postcard designs together, i then stitched a paper flower and button onto the ribbon with a strip of verse. The sets each had the same 7 cards, and i just placed a different image on the top of each one. 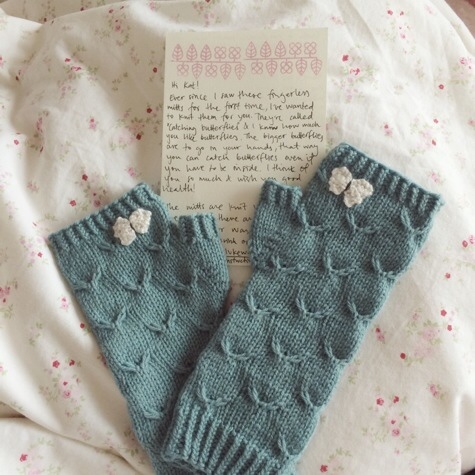 I am pleased with the way they turned out especially as it has given me Orla Kiely items to send friends who i know love her designs alot, and they are things that are easy and light to pop in the mail too. I love snowglobes,and this it turned out to be the only snow we had this year.It has been much milder and so far only one small flurry of snow a couple of weeks ago. I do think snow is pretty, and has a magic to it, but i do feel the cold, so i think this year at least, i would prefer it not to be as freezing as it has been the last few years. I have a few further collages today, by way of thanks to my lovely friends for their gifts over christmas. Keri-Anne sent me some of her beautiful blossom photos, and they are to signify the hope that i too will be blossoming in this new year. And a cd mix of her favourite tracks. When i listened to it on Christmas eve, i loved them all, and it felt almost like she and her little fairies were here visiting with me. thank you treasure, (i hope to do a further post about mix cd's later). 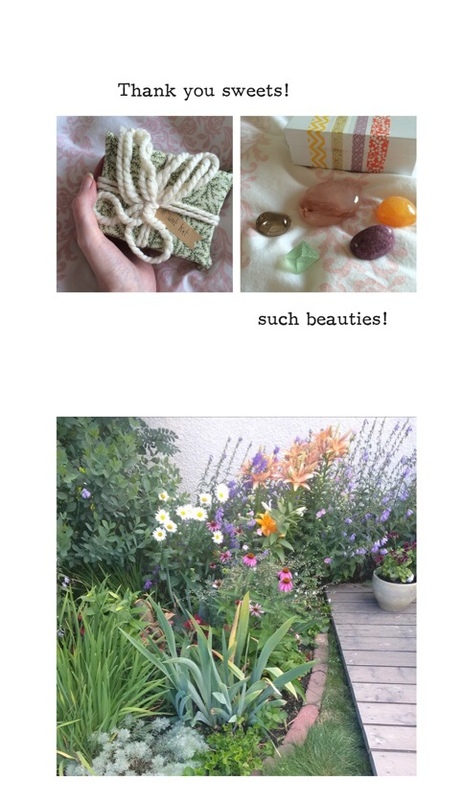 Louise sent me a butterfly box full of little treasures, such as a silver bunny, rose quartz from her crystal collection and a key, there was also a book of quotes and mini calendar. I was so touched by the collected things, all just for me. thank you so much sweetheart. Paula visits Betty's cafe ( a famous tea/coffee shop in Yorkshire) and i always wish i could accompany her. Maybe one day i shall. But in the meantime she brought me back some goodies from there...a book and chocolate, and the sweetest butterfly pin. thank you my love, your thoughfulness touched me so much. Last but not least a package from California, and my friend Cheryl who makes the most beautiful fairylike creations, here a little acorn pouch from liberty fabric (which i had given her earlier in the year) and some butterflies made into rings. Her daughter Maddy also is just so creative, and made the sweetest smallest rings into a paper garland. It would decorate a fairy's dwelling perfectly, and also looks so nice hanging upon my wall lights. Thank you treasure. I wanted to give my thanks to those that swopped gifts with me this year, it was wonderful to recieve your packages in the mail. And so often they arrived at the time most needed. Christmas was no exception, your kindness kept me going more than you may know. Above are a few of the wrapped presents that i sent out, i chose cath kidston wrap this year and used little red and white candy canes and east of india ribbon. Below is the gorgeous stationery Eadaoin chose for me, from Whimsy whimsical and Susannah Tucker on etsy and a cute cute little bunny brooch! !...thank you so much honey, lovely surprises! Dear Georgianna sent me one of her calenders of Parisian photos, and some pretty pretty stickers, along with a beautiful wintery christmas card and mini eiffel tower...thankyou so so much sweetie! Beth and i have just lately got in touch, i ordered some of her prints, and we also chatted through flickr, she included some as a gift for me and one of her Merry Christmas lights cards, and i just love them all! Thanks sweetie! It was such fun sending and recieving lots in the mail & sharing love, it makes christmas special to me.